The isolated island chain where Charles Darwin formulated his theory of evolution is under attack by a host of alien invaders. A new study has revealed the Galapagos Islands have more than 50 non-native species probably brought in on boats. This is nearly ten times previous estimates of non-indigenous species on the isolated islands 600 miles off the coast of Ecuador. Scientists documented 53 invaders in the waters of the UNESCO World Heritage Site, one of the largest marine protected areas on Earth. Before this study, published in the journal Aquatic Invasions, scientists only knew of about five. And the ‘stunning’ figure has worried scientists, who only surveyed part of the archipelago. One of the species, the bryozoan amathia verticillata, is known for fouling pipes and killing seagrasses. Another, the date mussel Leiosolenus aristatus, bores into Galápagos corals. Lead author James Carlton, an emeritus professor of the Maritime Studies Program of Williams College-Mystic Seaport said: “This is the greatest reported increase in the recognition of alien species for any tropical marine region in the world. The islands made famous by Charles Darwin’s visit in 1835 have long been recognised for their remarkable biodiversity. But with their fame, traffic has spiked. In 1938, just over 700 people lived on the Galápagos. Today, more than 25,000 people live on the islands, and nearly a quarter-million tourists visit each year. The scientists conducted field surveys on two of the larger Galápagos Islands: Santa Cruz and Baltra, where they hung settlement plates from docks one metre underwater to see what species would grow on them. They also collected samples from mangrove roots, floating docks and other debris and scoured the literature for previous records of marine species on the islands. Thirty of the new species could have survived on the islands for decades under the radar. Another 17 were species scientists already knew lived on the Galápagos but previously thought were native. One other species, the bryozoan Watersipora subtorquata, was collected in 1987 but not identified until now. Sea squirts, marine worms and moss animals (bryozoans) made up the majority of the non-native species. Almost all of the non-natives likely arrived inadvertently in ships from tropical seas around the world. To reduce future invasions, the Galápagos already have one of the most stringent biosecurity programs in the world. International vessels entering the Galápagos Marine Reserve may anchor in only one of the main ports, where divers inspect the vessel. If the divers find any non-native species, the vessel is requested to leave and have its hull cleaned before returning for a second inspection. Still, the authors say, the risks remain high. The expansion of the Panama Canal in 2015 may bring the Indo-Pacific lionfish–a major predator in the Caribbean–to the Pacific coast of Central America. Once there, it could make its way to the Galápagos, where the likelihood of its success would be very high. 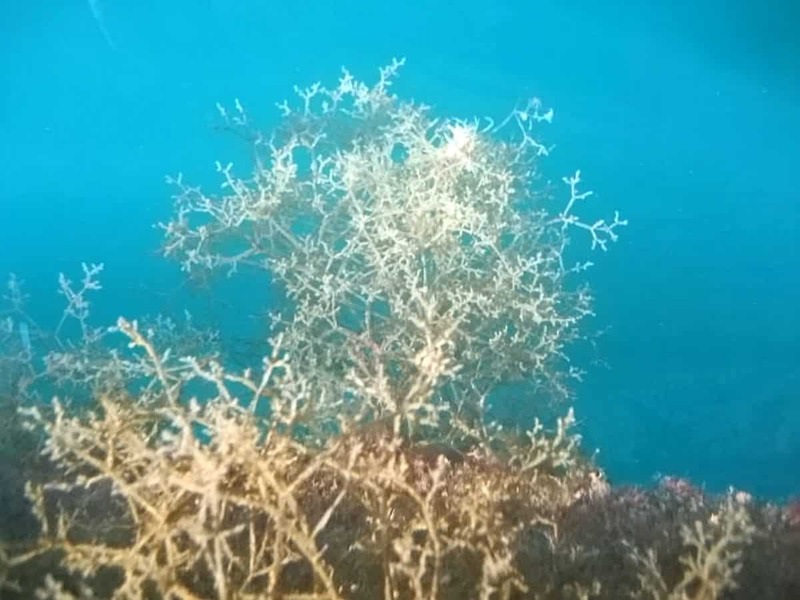 Another possible arrival is the Indo-Pacific snowflake coral, which has already caused widespread death of native corals on the South American mainland.